Lapin — fresh rabbit — is always available in French supermarkets and open-air markets. It's domesticated, not wild, rabbit — in other words, it's raised for food. The cooked meat is very white and very lean. It's not gamy. It tastes like chicken, as we say. You could very well make this recipe with chicken, in fact. Remove the skin to keep it lean like rabbit. I won't go into the details of cutting up a whole rabbit, but that's what I did. You can also buy parts and pieces. The meatiest parts are the back legs and the fillets (or "saddle" — rables in French). The front legs don't have as much meat on them but they're good too. As are the liver and the kidneys. I de-boned the fillets and trimmed as much meat as possible off the carcess. 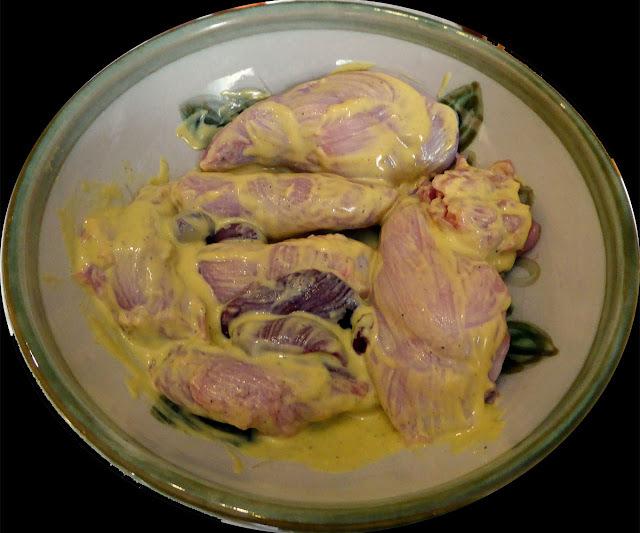 That lean meat can be chopped up and added to the mustard-cream sauce. The first step is to season the rabbit pieces with salt and pepper. Then make a marinade by mixing together about half a cup of mustard and a quarter of a cup of vegetable oil. Add a little bit of dry white wine if you think the marinade is too thick. Then brush it onto the rabbit pieces. Before cooking it, you can let the rabbit marinate for a few hours in the refrigerator if you have time. When I say mustard you can assume Dijon mustard. 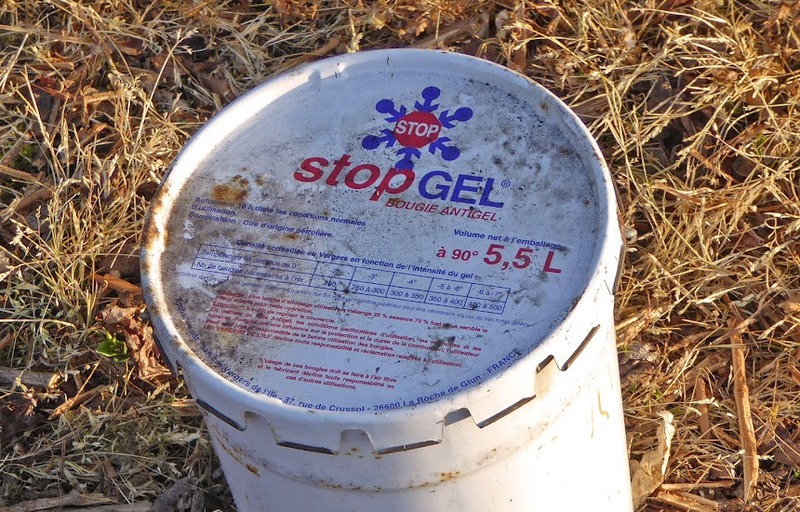 That's what people use in France. Or whole grain mustard, which has the same taste as smooth Dijon mustard. 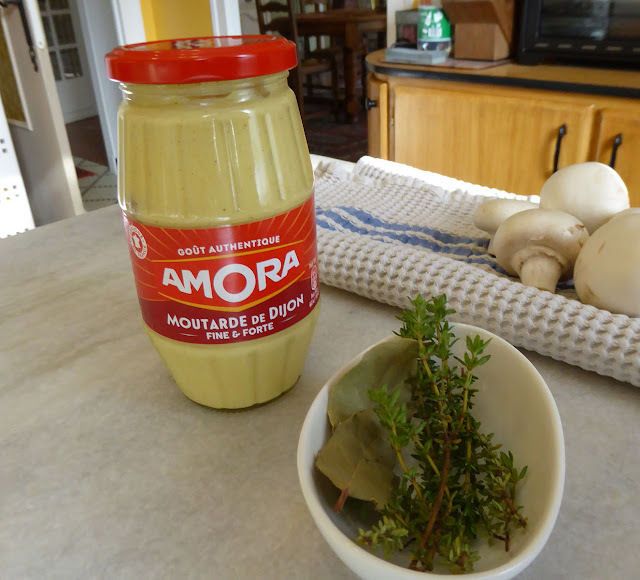 Such mustards can be very spicy if you eat them right out of the jar, but they become much milder when cooked. Other ingredients in the lapin à la moutarde are thyme, bay leaves, onions, garlic, lardons (bacon), and mushrooms. All are optional, but you do want to include good seasonings and herbs. You can brown the rabbit pieces in a pan on the stove or in the oven. I chose the oven, because it's less messy. Oil the bottom of a deep baking dish. Scatter diced onion and smoked pork lardons over the bottom of the dish. Arrange the marinated rabbit pieces on top of the onions and lardons. Set the baking dish, uncovered, in a hot oven, say 200ºC (400ºF), until the rabbit pieces are golden brown — for about 15 or 20 minutes. Adjust the heat (higher or lower, top or bottom) as you go to keep the cooking even. Meanwhile, mix together about a cup of cream with another quarter cup of Dijon mustard and some white wine. Drop in the thyme, bay leaves, or other herbs, along with some pressed or chopped garlic. Heat up that mixture on the stove, letting it boil and thicken slightly. I saved out the rabbit liver and cooked it in the cream mixture instead of browning it with the rabbit pieces. Separately, if you want, slice and sauté a dozen or so big mushrooms. When the rabbit pieces are golden brown, pour on the creamy mustard sauce and stir in the mushrooms. Let everything cook together for another 30 minutes or so — longer, if you want the meat to be falling off the bones. 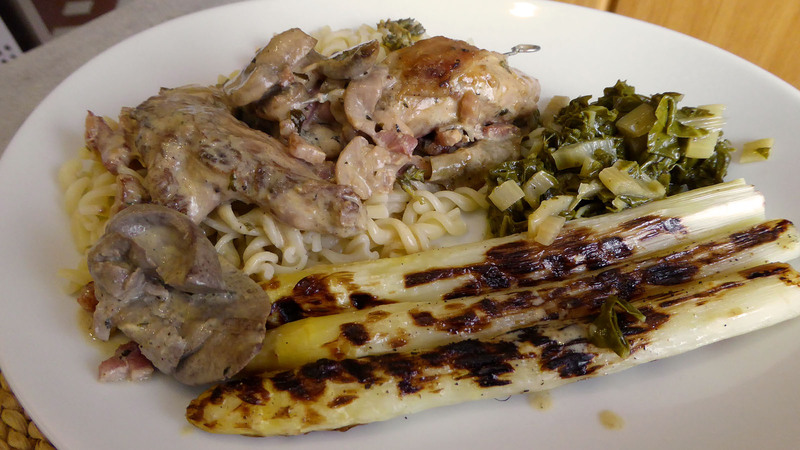 We served the lapin à la moutarde with some grilled asparagus spears, some steamed Swiss chard, and some pasta. Think of it as chicken or actually cook chicken this way — potatoes, either steamed or sautéed, would also be good. Or rice, for example. That's a piece of the rabbit liver that you see on the left side of the plate. ...et la journée du lapin. Asparagus is grown in the Sologne region, the southwestern edge of which is just over on the other side of the Cher river from Saint-Aignan. The soil over there is sandy and the land forms a flat plain that stretches from the Loire river, south of Orleans and Blois, all the way down to the Cher. It's perfect land for growing asparagus. 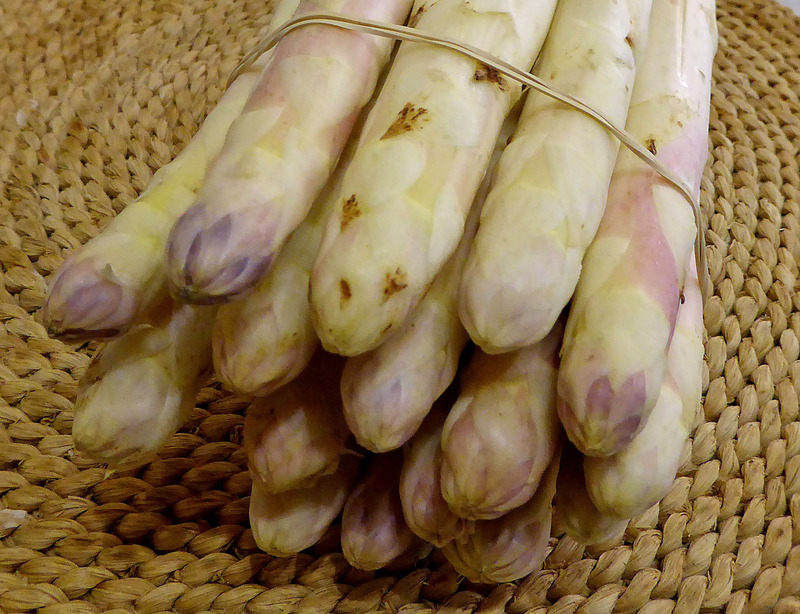 Notice how different les asperges look, compared to what you are probably used to. In most of France, it's the white variety that people grow and eat. The green variety is becoming more popular, but it's still not that easy to find locally. (It's actually the same variety, but grown differently.) 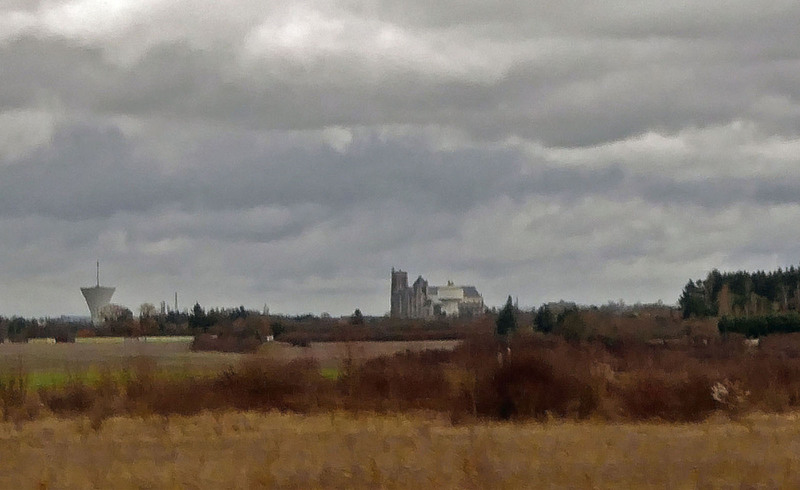 A group of growers of green asparagus has been formed up around Chambord (the famous château), but I don't see the point of driving all the way up there to buy the green spears. I like the white ones, whether poached or grilled, served with melted butter, home-made mayonnaise, or vinaigrette dressing. 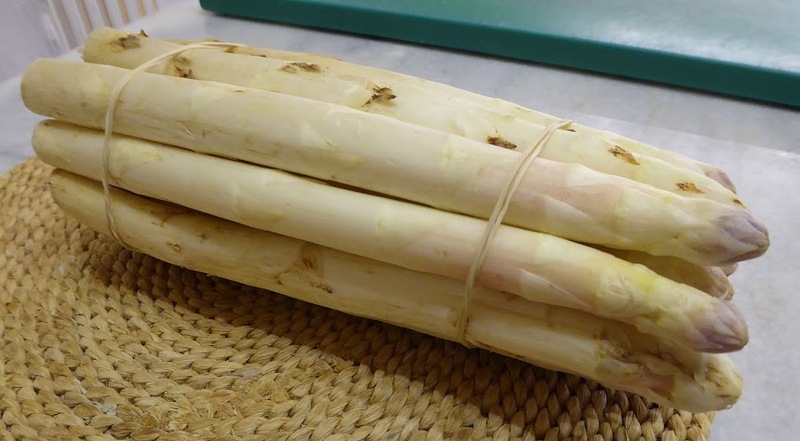 One of the biggest differences between white and green asparagus is that you have to peel the white spears. Starting about two inches from the top, use a vegetable peeler to remove the tough skin. It only takes a minute to two to do. Walt got the asparagus pictured here from a local grower (he also grows strawberries, another Sologne specialty) who sells his produce at the open-air market in Saint-Aignan on Saturday mornings. In season, of course, not year-round. 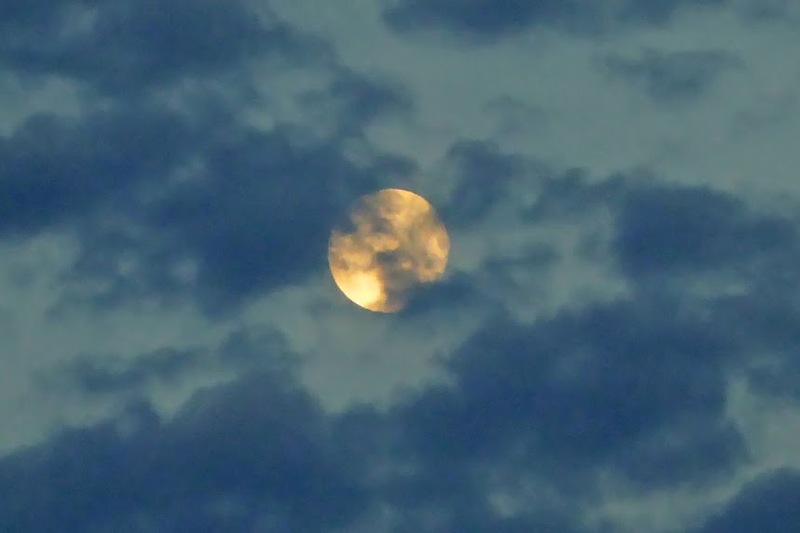 By the way, we have a very bright moon in our sky this morning. It was full yesterday, but the sky was cloudy. We had a couple of light thunderstorms over the course of the day. I mentioned lapin above. That's French for rabbit. It's what Walt and I cook for Easter — that's today — every year. It all started in the spring of 1984. We were living in Washington DC, having rented a Capitol Hill apartment for ourselves in June 1983. What should we cook for our Easter dinner? That was the question we asked each other. Easter, somehow, made me think of rabbit, which was something I had enjoyed cooking and eating in Paris between 1979 and 1982. And the rest is history. Rabbit for Easter is not a French custom — anyway, the Easter bunny is unknown in French culture. For us, Easter rabbit is a personal, private tradition. People in the Loire Valley eat rabbit year-round, and a lot of people raise rabbits for food. I confess. I'm doubting myself now. I don't think Walt and I did walk out onto the roof of Notre-Dame cathedral in 1988. In fact, I'm sure of it. I've been looking at aerial photos of the building, and I see that the peak of that roof is really sharp, with no flat surface to walk on. There's no way we walked out there. The mind and the memory play funny tricks on me sometimes. It was more than 30 years ago. Look at this aerial photo from Google Maps. Where we were standing, when an incident occurred that I remember clearly, was on top of the south bell tower, not out on the roof below it. We were admiring the views, and I took (I believe I took it; maybe Walt did) this photo, which I posted last January 29. You can see the edge of the north tower on the left in the photo, as Walt just pointed out to me. Other photos we took that day were slides; digital photography was not yet a reality. The slides are packed away in a box in a closet up in the loft and we haven't tried to find them to see what other pictures we might have from that day's adventure. Looking at other pictures might have clarified my memory. Here's the incident I remember from that day in, I believe, 1988. In the aerial Google Maps photo above, you can see the metal caps on the tops of the towers. Other people were up there on the roof of the south tower with us when we were. One guy climbed up onto the metal cap to get a view from even higher up. He looked back over his shoulder and called out to his companions: « Monte là-dessus ! Tu verras Montmartre ! » ("Climb up here — you can see Montmartre!") Walt burst out laughing, because he had heard me quote that expression in the past. He was amused to hear it in this context, coming out of the mouth of a Frenchman. That's what I recall. The south tower is the one on the right in this photo. Fire got into the north tower Monday night — we saw it clearly on television coverage of the inferno. But the pompiers we able to put it out. The two bell towers are still standing. Tu verras Montmartre ! is a joke people quote to tease people who boast about having a view of Montmartre and the Sacré-Cœur basilica from the windows of their modest Paris apartment. Often, you'd have to climb up on a chair or some other piece of furniture and really lean out the window and crane your neck to actually see that kind of view. Walt lived in an apartment like that when he was a student in Paris in 1982. It comes from a 1922 song with that title. In the lyrics, it says braggarts might even go so far as to claim that on a clear day you can see Chartres from their windows. You can hear the song here on YouTube. So there's my confession and my correction. 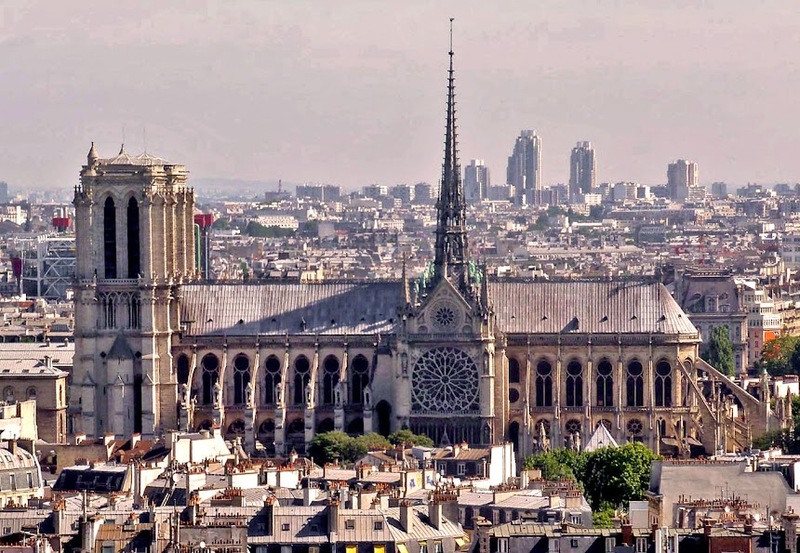 I think my mind confused memories of our walking across the top of the Pont du Gard aqueduct in the south of France in 1989 — we really did do that — with our Notre-Dame de Paris rooftop experience in 1988. And just above are two more of my old Notre-Dame photos. You can see people up on top of the south tower in the last image. In March 2011, I took one of my annual trips back to coastal North Carolina to spend time with my mother, sister, and nieces, as well as with cousins and friends I grew up with. I stayed a night in a hotel in the Latin Quarter (the Hôtel du College de France), just steps from Notre-Dame, the Sorbonne, and the Cluny museum. In the evening, before going out to the airport the next morning to catch my plane, I went for a stroll over to the other side of the river and around the cathedral to take some photos. Then I went and had dinner in a pizzeria in the Latin Quarter, if I remember correctly. That was eight years ago, already. Nowadays, I usually take the train from Saint-Aignan to Tours, and then directly to the airport instead of spending a night in the center of the city. 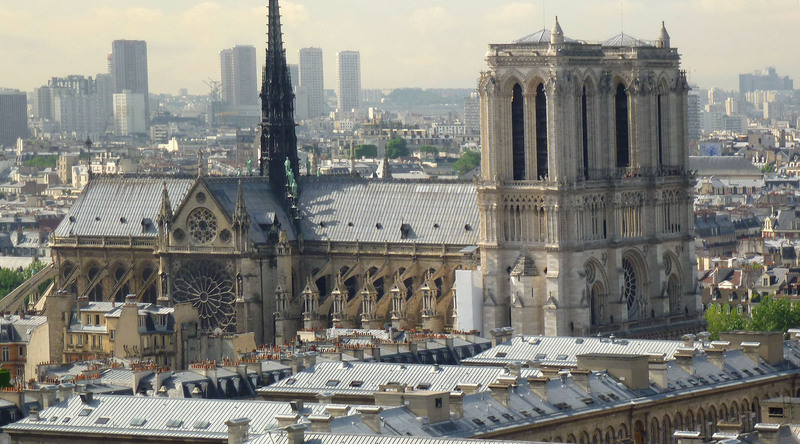 Here's a photo that shows the fleche (spire or steeple) that burned up in the fire last Monday and then toppled over, piercing the cathedral's roof and falling to the floor inside the building. I'm glad I took these pictures, which came out better than I thought they would. The cathedral is like some kind of phantom, standing tall and luminous against the black nighttime sky. Here is a full-on view of the façade of the cathedral. These are the bell towers, and there's a rose window in the center, with intricately carved doorways below, opening into the building. Even though fire got into one of the towers Monday night, it survived basically intact. Firemen were able to put it out before this part of the church was heavily damaged. 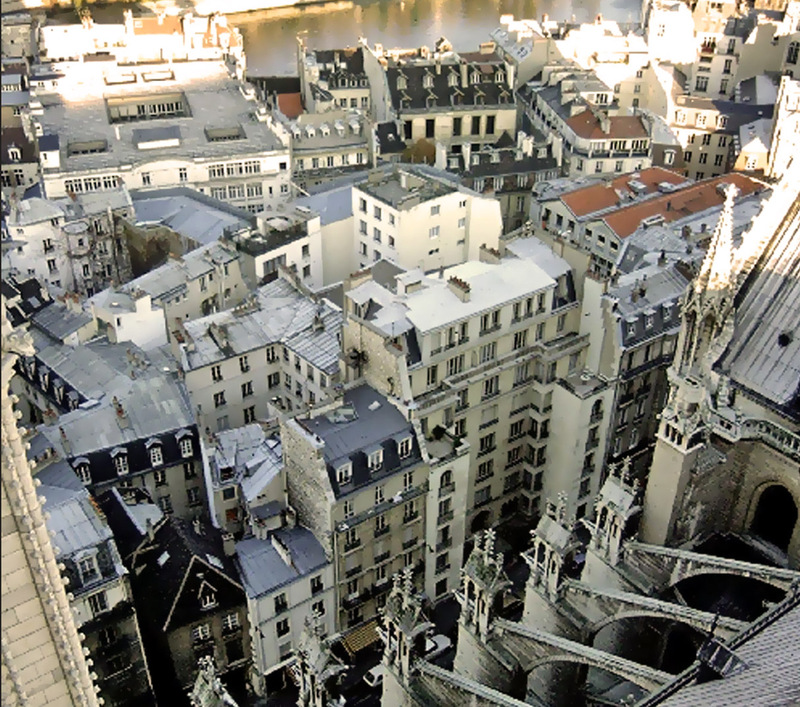 Here are two photos that I took from the top of the Tour Saint-Jacques in central Paris. I climbed the 300 steps to the top of that old tower in late July 2013. It was hot and humid that day in Paris, and there was a definite summer haze in the air. 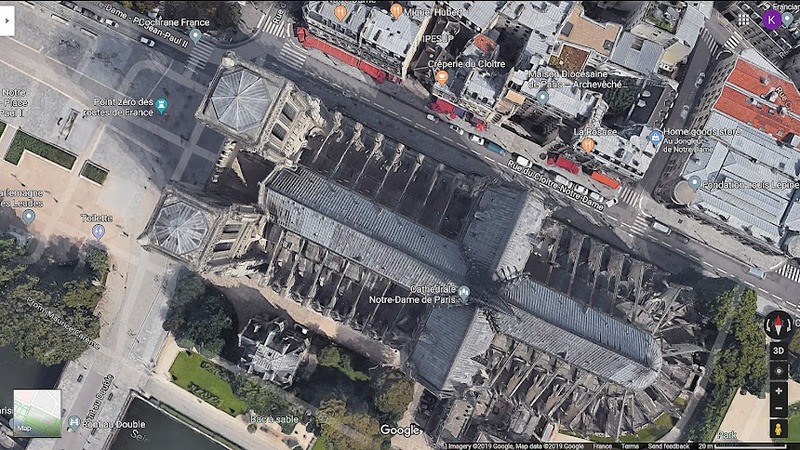 I've been busy exploring my photo archives, which contain something like 250,000 files, with an eye out for photos of Notre-Dame de Paris taken from different angles and in different light conditions. 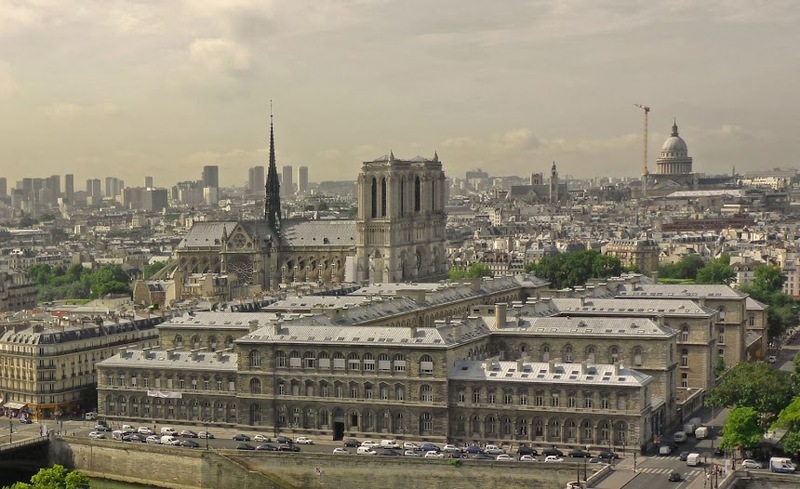 In the image above, you can see the Paris Panthéon off in the distance — it stands just about 800 meters (half a mile) south of the cathedral. I worked in its shadow for a few years back in the mid-1970s. 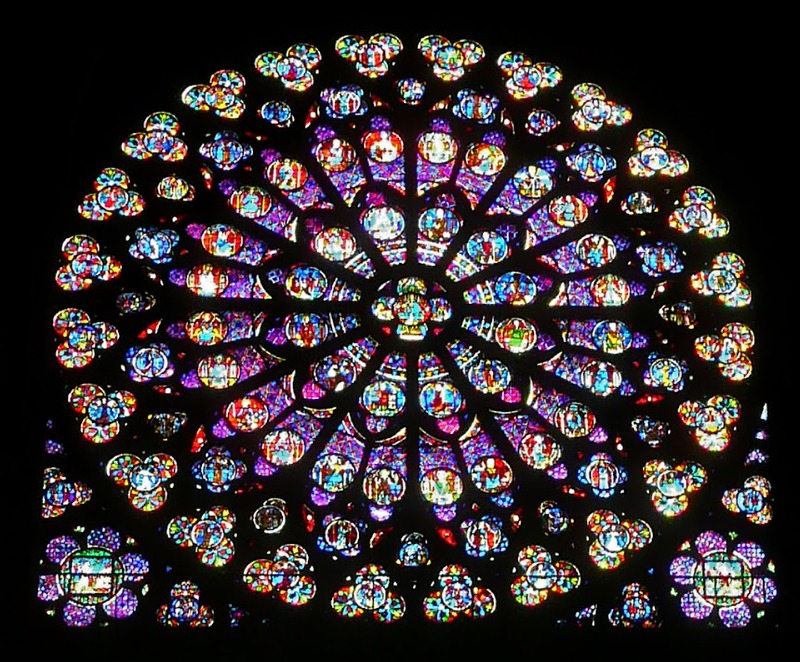 Last night I saw photos that made me think that the south-facing rose window at Notre-Dame had been destroyed by this week's fire. Fortunately, I was wrong. 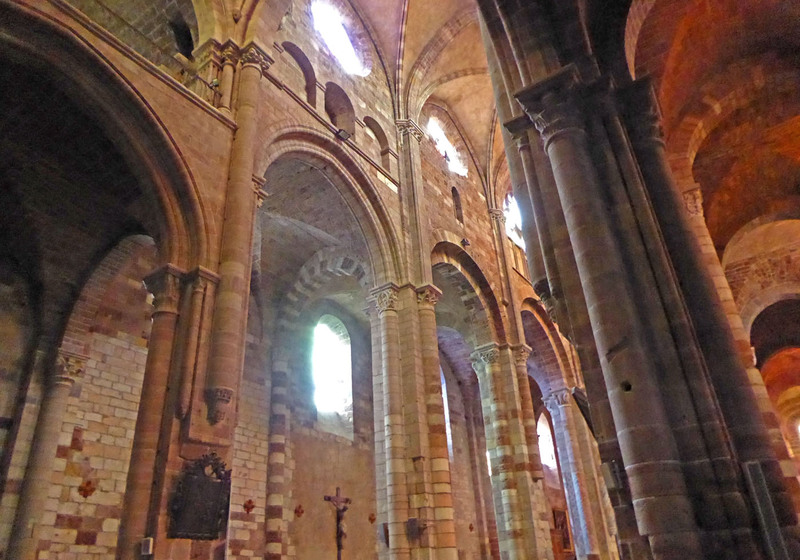 Some research this morning shows me that all three of the cathedral's rose windows, including the Rose Sud a.k.a. Rose du Midi, has withstood the fire and water. My picture dates from my last walk around the inside of the cathedral, in September 2007. The Rose Sud dates back to the year 1260, when it was installed in the wall of the church. 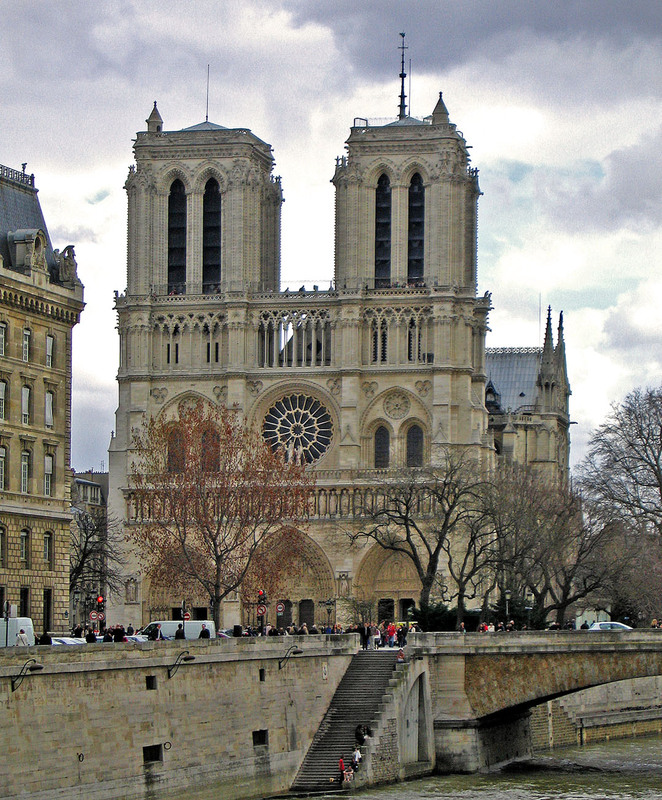 It was a gift to Notre-Dame cathedral from the French king Louis IX, who is also known as saint Louis (b.1214-d.1270). The diameter of the window is about 13 meters (more than 40 feet). There are two other rose windows in the cathedral, one on the opposite (north) end of the transept, and the other in the front façade between the bell towers. You can see the Rose Sud in the photo above, which I took a few years ago from the "balcony" of the Panthéon in the Latin Quarter. It is the big round stained-glass window near the center of this image, directly under the spire that fell during the fire. The smaller and less ancient window just above it appears in yesterday's photos to have succumbed to the heat of the fire. Above is another view of the cathedral from afar and on high. I took it from the top of the Tour Montparnasse in April 2002. Walt and I were spending two weeks in a rented vacation apartment about about a five minute walk from the tower, and took advantage go up to the top and take some panoramic and long-zoom photos of Paris. I had a new Canon digital camera at the time. 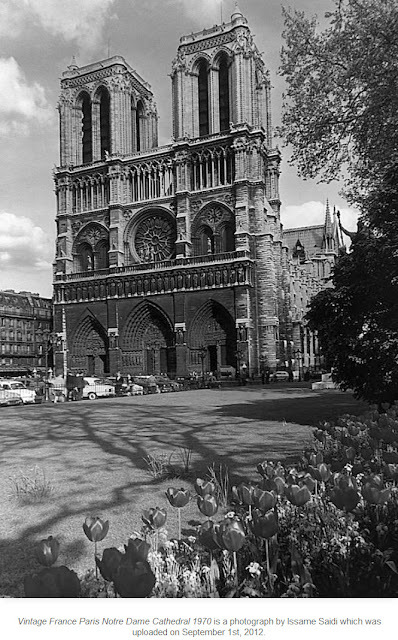 Speaking of photos from long ago, here's one that I found on the internet showing what the façade and bell towers of Notre-Dame looked like in 1970. This is the way I remember it from my first stay in Paris in March or April that year. I was spending a semester in Aix-en-Provence as a student and had decided to go to Paris for my two-week spring break. I stayed in a hotel in the Latin Quarter and was thrilled to be able to explore the city. It's hard to believe that was nearly 50 years ago. 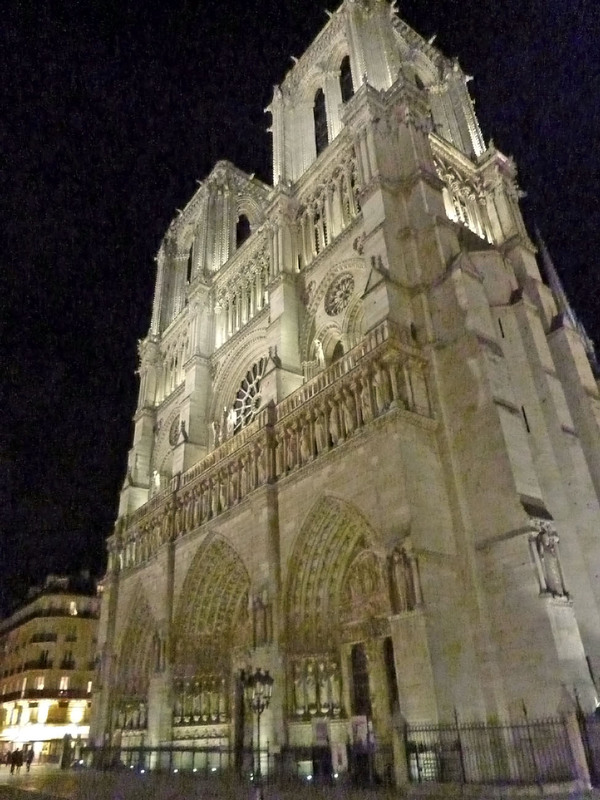 Here's a much more recent photo of Notre-Dame — I took it in April 2007. The black grime was scrubbed off the church back in the 1970s. This part of the cathedral looks the same today, as far as I can tell. It wasn't much damaged by the fire that raged behind it Monday night. There's that to be thankful for. 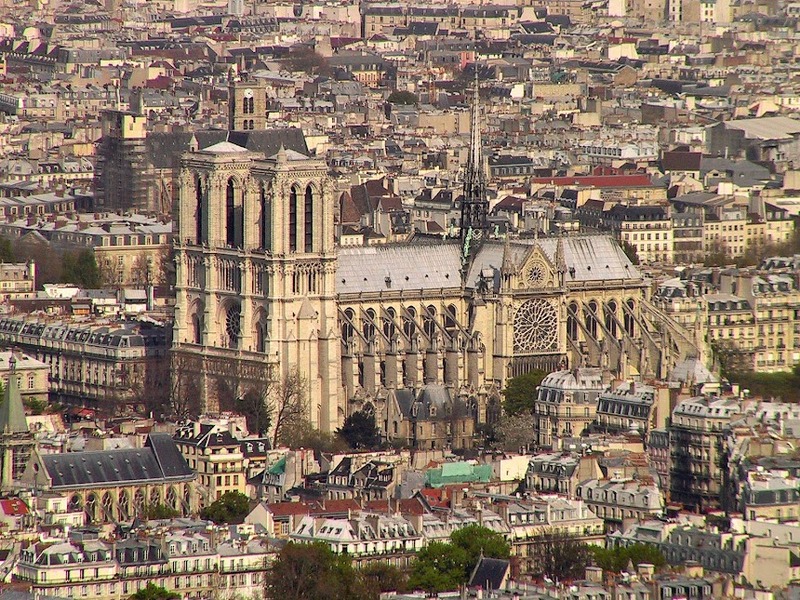 French president Emmanuel Macron says he wants Notre-Dame cathedral to be rebuilt within five years' time. Many experts are saying that is unrealistic. Only time will tell. 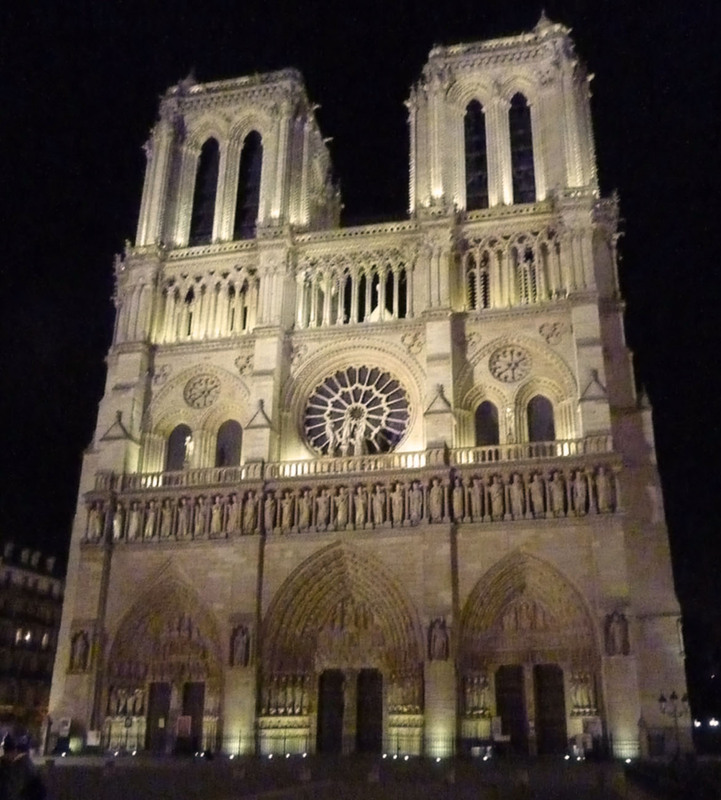 If you look at this blog often, you might remember that I've recently posted many photos of La Cathédrale Notre-Dame de Paris that I've taken over the past 20 years. Here's a set from April 1, 2013. They're in chronological order, unedited. I was in Paris, on my way to North Carolina, and was walking from my hotel to a subway station to catch a train out to the airport. This morning, one of the Paris newspapers, Libération, carries this banner headline on page 1: Notre Drame. 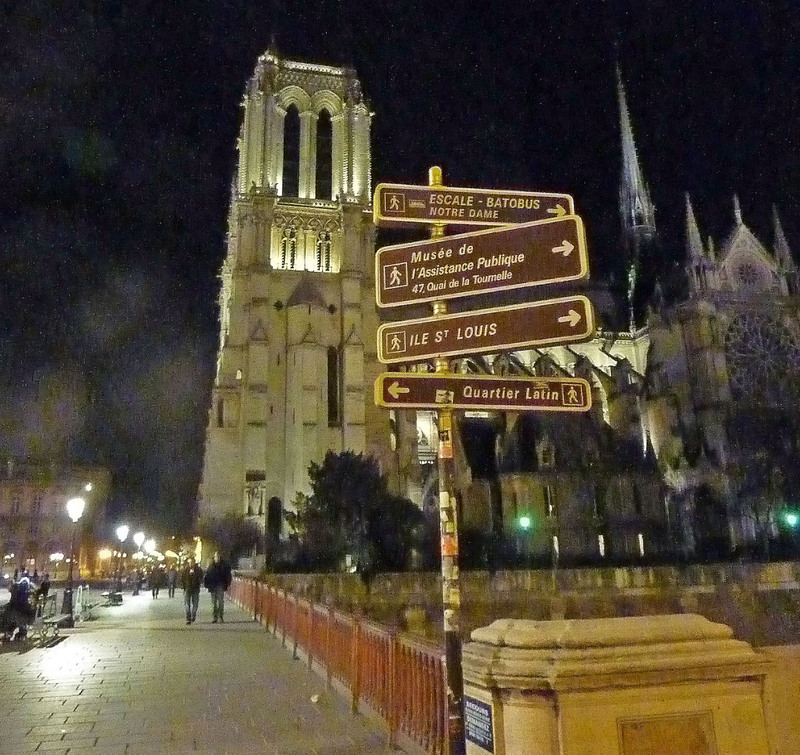 When you've spent time in Paris, you've probably rushed, strolled, sauntered, and even driven past Notre-Dame hundreds if not thousands of times. I first saw it in 1970. I must have gone inside, but I don't even remember. It was overwhelming to a small-town American at age 20. The last time I actually walked around inside the cathedral was in 2007, when my sister and a friend were visiting France for the first time and I was showing them around. I'm so glad I went inside then. There are photos here and here. Walt pointed out a minute ago that we might not live long enough to see the restoration completed. Here are some more of the plants in our big back yard that I hope have survived our recent frosty mornings. We don't see any smudge pots or hay bales burning out in the vineyard this morning. Our thermometer reading is slightly higher right now than it was 24 hours ago. Tonight rain is supposed to move in and tomorrow's morning low will be a lot higher. Finally. These just might have been our last cold mornings of the season. Here's a a brief description of the photos in this 80-second-long, ten-photo slideshow. The first two show a perennial plant that grows in our yard and that we call saxifrage because the previous owner of our house called it that. The scientific name is Bergenia crassifolia, and it's in the Saxifraga plant family. It's commonly called Bergénie or Oreilles-d'éléphant in French. It flowers in winter and is very hardy. The second two photos are of peonies (pivoines in French). They have big round flower buds on them right now. I hope that they are survivors. If they are, I'll take photos of the open flowers very soon. The next three photos show plants that we want to survive because we want to eat what they produce: plums on a branch of a tree I planted a long time ago; an apple blossom on a tree that is slowly dying, so we hope what might be its last apples are good ones; and finally, Swiss chard, which is also very hardy, and the leaves actually benefit from being frost-bitten before being harvested. The last three photos are of a flowering Prunus tree. That's a genus that includes cherries, plums, peaches, almonds, and apricots. The one in our yard is purely decorative and doesn't produce any fruit. It's pretty though. 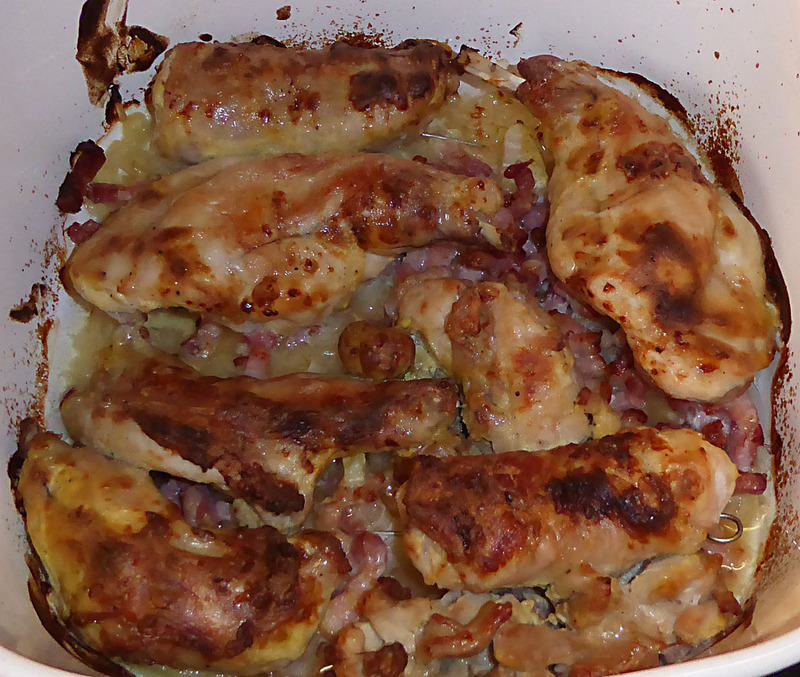 Poulet à l'estragon, or tarragon chicken, is a classic French dish. I remember the first time I ever tried it. In 1972, I was teaching English in a lycée (secondary school) in Rouen, a big city in Normandy. A French couple I had met through American friends who were also working in Rouen that year invited several of us over for dinner — they were getting ready to go live and work in New York for a few years and wanted to get to know us and practice their English. They served us poulet à l'estragon, which I had never even heard of before. It was delicious, and obviously memorable. Above is a slideshow that I think is fairly self-explanatory. You start the recipe by cutting up a whole chicken so that you have eight pieces — two each of the drumsticks, the thighs, the breast filets, and the wings (with a portion of the breast meat attached). You can of course use chicken pieces and chicken broth from the supermarket and save yourself some prep work. I can give you a more detailed recipe if you want one, but maybe the summary below will be sufficient. Brown the chicken pieces lightly in butter and/or oil and take them out and reserve them. Separately, sauté some mushrooms. Then sauté some diced shallot or onion in the fat the chicken cooked in. Put the chicken and onion together in a pot and pour chicken broth and an equal quantity of white wine over all to barely cover. Cook on medium heat for 20 to 30 minutes. Then add a good amount of cream, the sautéed mushrooms, and some fresh or dried tarragon. Don't forget the salt and pepper. Let it cook for another 10 or 15 minutes. If the sauce is too liquid, take the chicken and mushrooms out and boil the liquid down to thicken the cream. Serve the chicken with rice, potatoes, or pasta and the sauce. Garnish with some fresh tarragon leaves if you have any. Enjoy. Here's one more photo of the cowslips (coucous). Enlarge it and pan across it to see detail. P.S. It's about one degree C (two ºF) colder this morning than yesterday at this time. 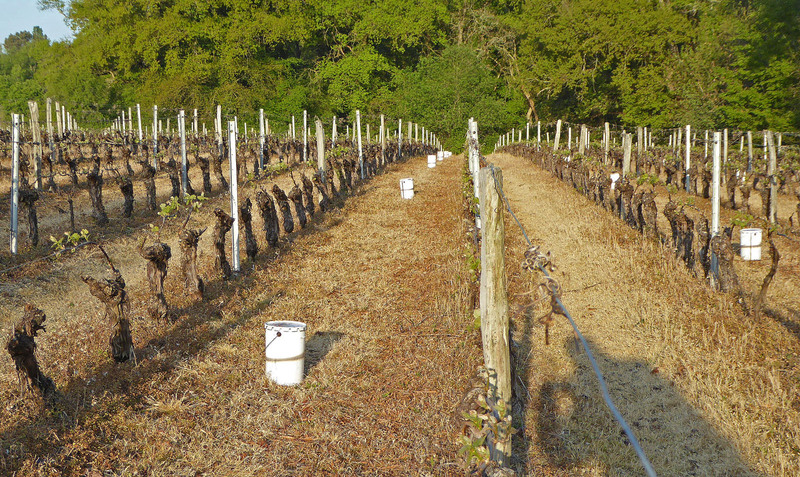 The Renaudie vineyard people have their smudge pots burning. Our thermometer is mounted on an exterior wall of the house, so it reads a little high. Even though the smudge pots are only, say, 100 yards from the house, it's probably significantly colder out there. Yesterday morning, I took my camera out with me on the daily walk with the dog. 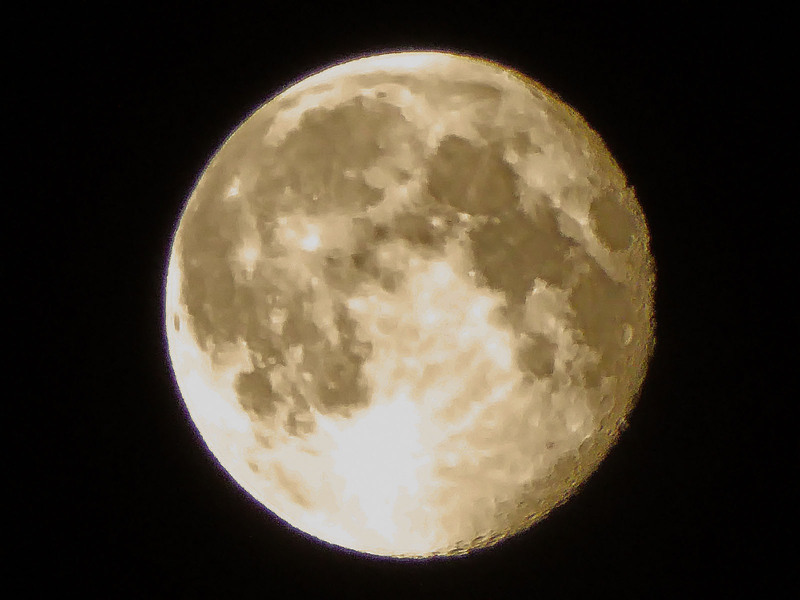 It was really too dark to get the best results using the camera I have, but I did get a few salvageable shots. As I've said, there are flowers and blossoms everywhere right now, despite the morning frosts and freezes we're experiencing right now. Here's a slideshow that lasts just over one minute. On our outdoor thermometer, the reading now is just slightly lower than it was 24 hours ago but not all the way down to 0ºC. The flowers in the slideshow above are primroses that come up spontaneously in our yard every spring, some plum and pear tree blossoms, purple flowers on our lilac bush, and yellow cowslips that grow wild all around the hamlet and vineyard. Morning temperatures are supposed to be down to freezing, or even slightly below, these next few mornings. This is a critical time for fruit trees and especially for the vineyards and the people who own and tend them. We had warm, sunny weather early this year, back in late February and again in mid- to late March, so the plants got ahead of themselves and are especially vulnerable to frost and freezing temperatures right now. Yesterday the people from the Domaine de la Renaudie, who own all of the vineyard plots that border on our hamlet and yard, came and set out smudge pots on the northern edge of their vineyards. A north wind is blowing right now, and it's cold. Afternoons are warm but mornings are frigid. I guess lighting what are called bougies ("candles" — smudge pot = bougie antigel) on the upwind edge of the vineyard plots will warm the air currents just enough to prevent freezing. That's the theory and the hope anyway. You might remember this post Walt did with photos of the burning bougies back in 2017. I was up early this morning. I couldn't sleep for most of the night. Anyway, it's 5:05 a.m. right now and a couple of cars just drove by the front gate. That's unusual. I'm sure it's the Renaudie crew out lighting the smudge pots. We all remember that we were in this same situation two years ago. (My photos in this post are from April 2017.) Right now, the apple trees in our yard are covered in blossoms, as is our big lilac bush. Cherry trees all around the vineyard are blooming too. The plum tree I planted a decade ago is covered in tiny plums. We can only hope the damage won't be too bad. The people who will suffer the most if the frost is very damaging are the ones who make their living by growing grapes and making and selling wine. The day we went to see the villages of Le Monastier, Goudet, and Arlempdes in the southern part of the Haute-Loire, we drove back north toward Le Puy and our gîte on little back roads. Along the way, looking at the map, Walt noticed that there was a waterfall along the way, near the village called Le Brignon (pop. 600). We decided to stop and see if we could get a photo of it. The photo above shows what the countryside around Le Brignon looks like. A small river called la Beaume cuts a fairly deep valley near the village as it flows northeast and joins up with the Loire river. La Beaume is just six miles long, while the Loire is 600 miles long. Leaving Le Brignon, we came to a turn-out where we could park the car. 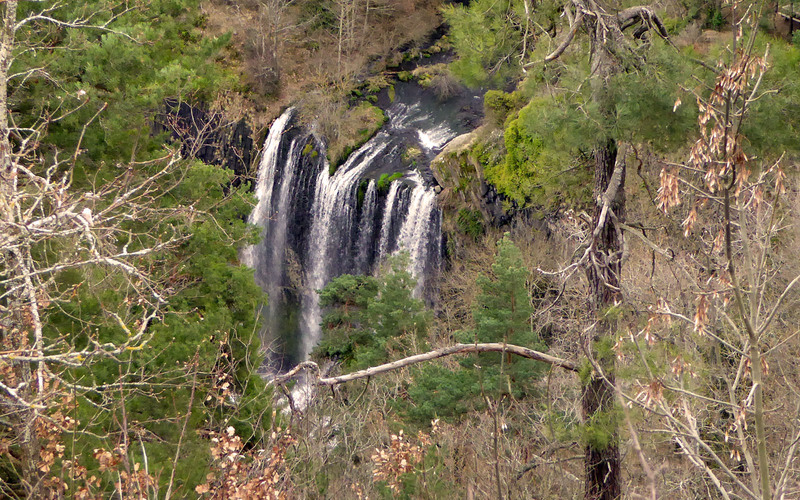 We were on high ground, and we weren't sure we wanted to walk all the way down to river level at the bottom of the waterfall, la cascade de la Beaume, which is 27 meters (about 90 feet) high. We walked part way down a path and got the view you see above. We thought the sign above was funny. 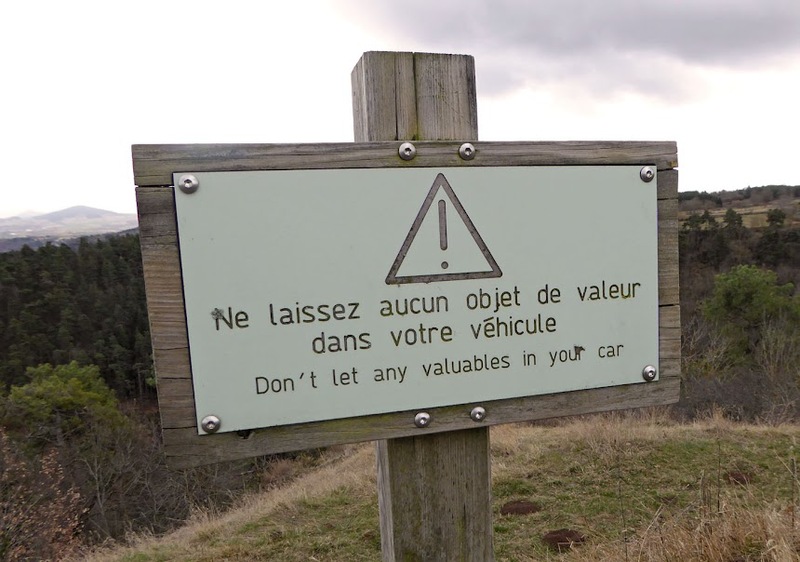 If you just read the English translation of the French warning, you might get the idea that your valuables are out walking around, clambering to get into your vehicle. The headwaters of the Loire are somewhere off in the distance in this photo. We didn't drive quite that far south. Over the past week or so, I've been noticing a lot of loud birdsong when I go out for walks with Tasha the Sheltie, especially early in the morning. Yesterday I opened the kitchen window at about 7:00 a.m. to checke if it was raining and again was struck by how melodious all the loud chirping was. Here's a brief sample — you'll need the sound on your device or computer turned on to hear it of course. Birdsong only and some woodpecker hammering, that's all you'll hear. As far as I know, Blogger doesn't "host" audio files, so I took a movie. Not much action, but a good bit of noise. The one bird I didn't catch on this video is the cuckoo, which has come back from Africa... more than one of them, of course. Often, there's one sitting in the top of our big cedar tree cuckoo-ing its lungs out this time of year. Here are some posts about cuckoo birds, and one includes a short video on which you can hear the cuckoo's call. 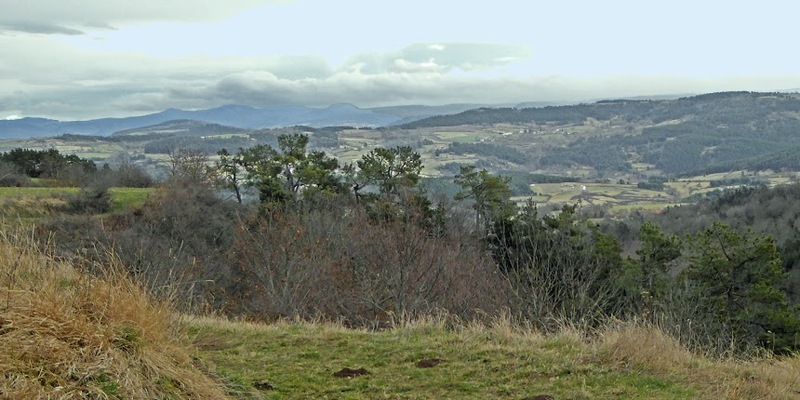 We left the gîte du Riou in Le Puy (Auvergne) at about nine o'clock on that Saturday morning, March 9, and stopped to spend an hour or two in Brioude, which I've been blogging about for more than a week. Then we got in the car and drove the 3½ hours to Saint-Aignan on the autoroute. I was going to do a slideshow of some of the photos I took along the way, but instead I've decided to post just three images. About 25 kilometers (15 miles) north of Brioude, and on the southern edge of the town called Issoire, we drove past the place called Le Broc. The Wikipédia article about the village says that about 700 people live there. At Le Broc, there's a hilltop medieval castle that's now in ruins, there's a medieval priory called La Commanderie de Chassaing, and there's also a prehistoric dolmen. Plus there's an airport. The priory is the tall, rectangular building you see in the foreground of my photo. This second place is a town not far north of Le Broc, where the Couze Chambon river flows under the autoroute and into the Allier river, which is itself a tributary of the Loire. The village is called Montpeyroux and is one of the plus beaux villages de France. It's another place I'd like to see, but there are so many of those in France that, well, good luck! Maybe someday. Here's the page about Montpeyroux on the official Plus Beaux Villages web site, and it includes a short photo gallery showing the local sights. Upstairs there were three bedrooms, two of which we didn't need to use. One had two single beds. The full bathroom with a good shower (and another WC) was upstairs too. I liked the way two of the bedrooms had built-in closets — I think they might have been old wooden wardrobes that had been fitted into the walls. The third bedroom had a nice wardrobe too. Everything was spotlessly clean and comfortable. We never needed to use the electric radiators in the bedrooms upstairs, but we did use the towel warmer in the bathroom. We ended up not paying anything extra for electricity. The house, we learned, was the house that the owners — a brother and sister in their 60s, I'd say — were born and grew up in, and it's attached to an old stone barn. The brother lives in the more modern house you can see across the way in one of the first photos in the slideshow. He was available to help us with things if we needed him, but we didn't, and the only time we saw him was on arrival and again on departure. The sister lived in a village a few miles away, she said. The owners don't speak English, and they were relieved to find out that we spoke decent French. In the big yard between the gîte and the one owner's house there was a flock of chickens. We enjoyed farm-fresh eggs during our stay. 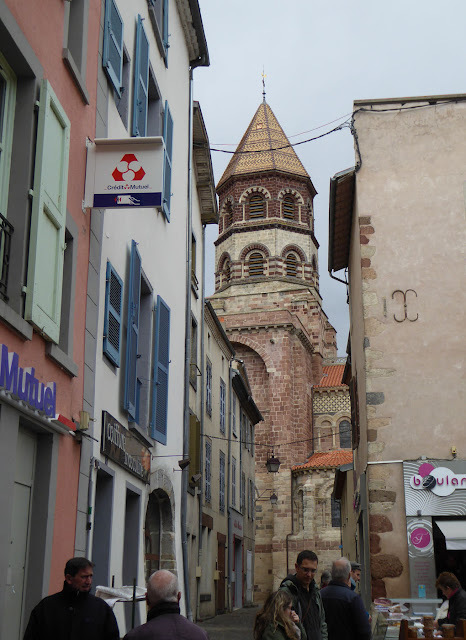 However, we were only about two miles from the center of the city of Le Puy-en-Velay, and close to a modern shopping area. We were back in Saint-Aignan by mid-afternoon that Saturday in March, after having spent a good part of the morning in Brioude. The weather cooperated, and we had just a little bit of rain on the 3½ hour drive on autoroutes past Clermont-Ferrand (home of Michelin tires), Monmarault (Callie's "home town" — remember Callie? ), Saint-Amand-Montrond (at the geographical center of France), Bourges (fantastic cathedral), Vierzon (a railroad town), and then on east to Saint-Aignan. 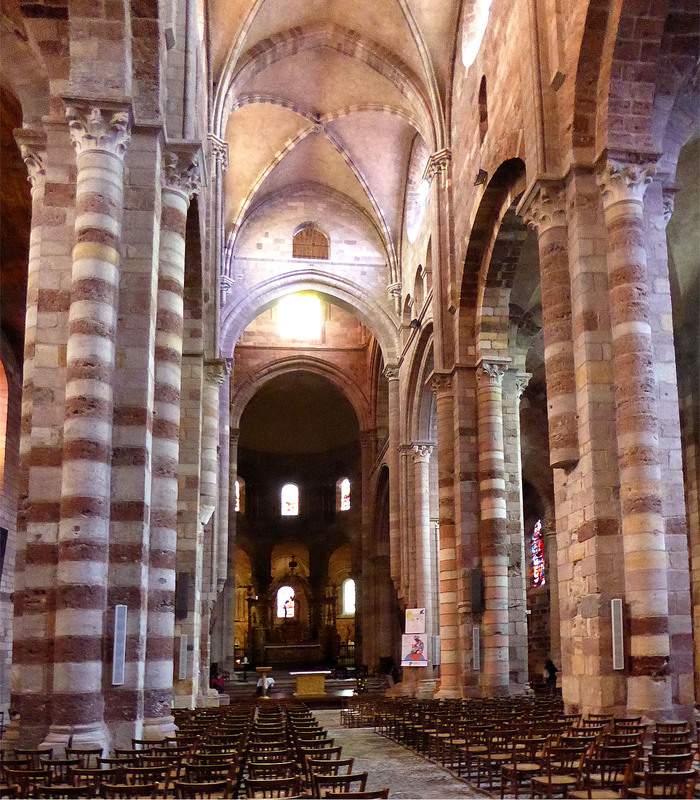 Here a last couple of photos of the Basilique Saint-Julien in Brioude. They somehow never appeared in the posts I've done over the past week. I guess they are a little redundant, but here they are quand même. The tour group above is the group I followed into the church and tried to sidestep as I was taking photos. Below is a last Brioude slideshow. The church is the star of it. Today is Sunday, after all. It's just eight photos I had left over. The first one shows that same tour group as the group entered the basilica. In other photos, you can see from the outside some of those contemporary stained-glass windows that were installed in the church in 2008. I wouldn't mind going back to Brioude one day. There are several châteaux in the area, as well as some religious buildings including La Chaise-Dieu. But I'll probably never go back. We've been to the Auvergne three times over the past 10 years. The first trip, in 2009, was to the Cantal, which is the southwestern part of the region. We went with our friends Evelyn and Lewis, and their friend Linda. We had a great gîte, enjoyed the town of Salers, drove up to the top of a mountain, the Puy Marie (in the rain), walked out into a pasture to see the cows being milked (stepping carefully), and went to a dairy farm to see the cheese-making process. In 2018, Walt and I spent a few days in the Allier, in northeast Auvergne. And then this year the Haute-Loire, in southeast Auvergne. It has all been fun, but it's time to move on to other regions for our mini-vacations. We were in the Auvergne town of Brioude (pop. 6,700) on Saturday, March 9, 2019 — four weeks ago today. After finding a place to park the car, we walked around looking for the church. It wasn't visible from the part of town we were in, which was along the main north-south boulevard. We walked around and saw a lot of people who seemed to be either coming from (full shopping bags or baskets) or headed toward (empty bags or baskets) the town's open air-market. Walt said the church was bound to be near the streets or place (square) where the market was set up, so we walked with the empty-basket people toward the market. And there was the church. This slideshow is made up of a dozen images and runs for less than one minute before looping. After walking around the church building and taking turns going inside to see it while the other of us waited out in the street with the dog (it was windy and chilly, typical March weather), we walked over to the market to buy some cheese. We were successful, finding an excellent cheese vendor on the large, uncrowded market square, but we didn't try to walk through the narrow streets that seemed to be the center of the action — not with Tasha on her leash. There were just too many people. Oh well. It was getting to be time to hit the road for the long drive home to Saint-Aignan anyway. This slideshow made up of some detailed and close-up photos I took in and around the church in Brioude consists of 14 images and runs for about two minutes. 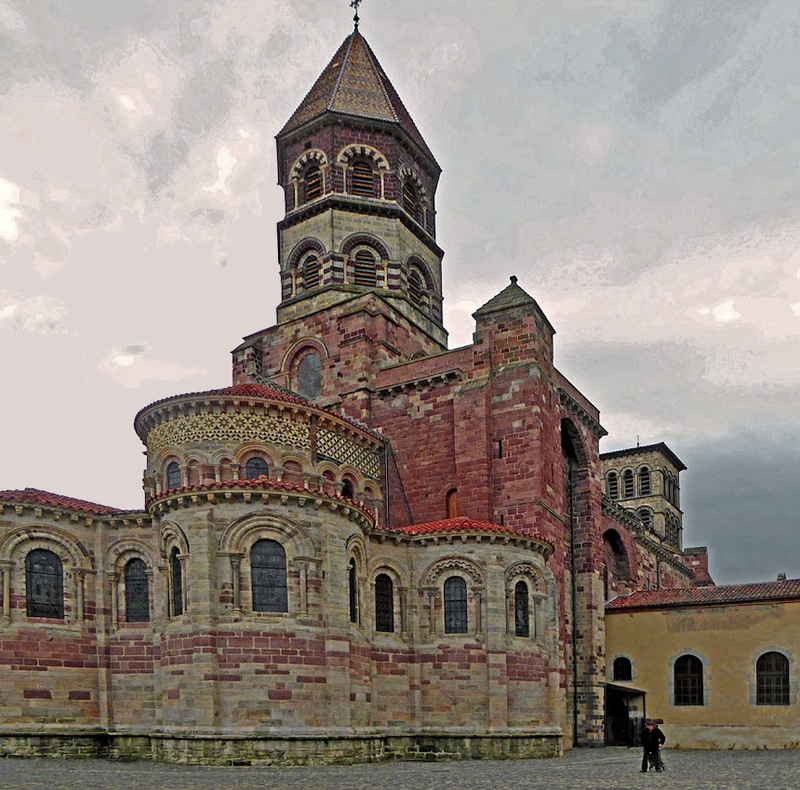 Brioude is a town in Auvergne, about halfway between Clermont-Ferrand to the north and Le Puy-en-Velay to the south. Here in Saint-Aignan, we're hoping we didn't have our spring weather for the year in late February and late March. The weather has turned cold again, and a little rainy. It's getting to be time to get serious about preparing the vegetable garden for our 2019 plantings, and about repotting a lot of house plants. Walt already has seedlings coming up in little pots. It'll be interesting to see how the soil in the garden will look when we take up the tarps we spread over it last fall. Some warmer temperatures will be welcome. I'm struggling a little with "clock lag" — or maybe it should be called "body-time lag" — since we moved our clocks ahead by an hour last Sunday. The sun comes up later, and with all the cloudy skies we've been having this week, sunrise is effectively even later now than the clock says it is. We had gotten used to seeing daylight before 7:00 a.m. Now at 8:00 some mornings it's still kind of dark outdoors. 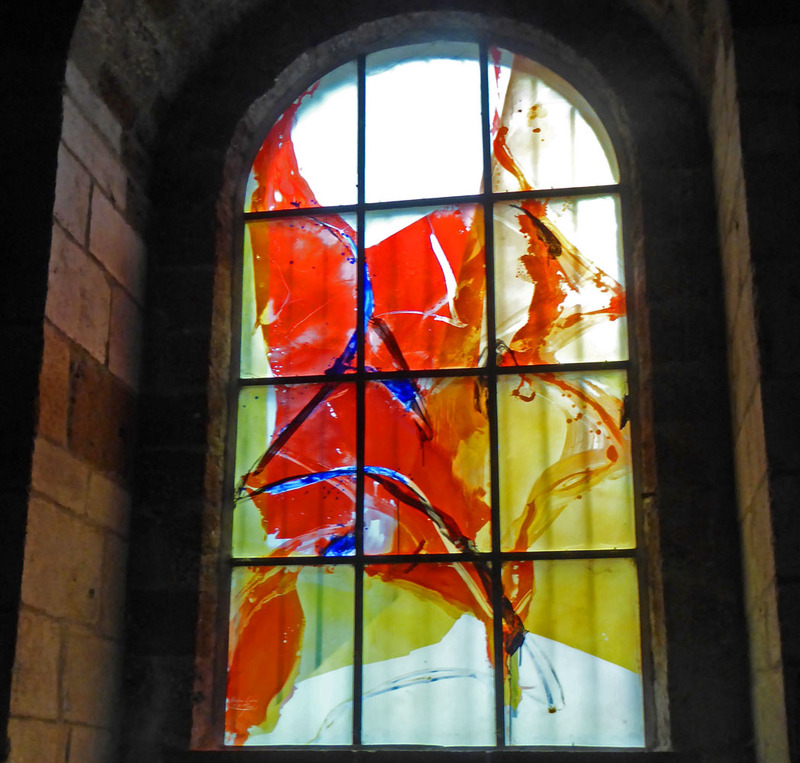 One reason why the inside of the Basilique Saint-Julien in Brioude is so colorful and luminous is that new, brightly colored stained-glass windows (vitraux) were put in place all around the church in 2008. They replaced plain clear glass windows, changing the church's look and feel completely, I'm sure. The new windows were designed by a Korean priest named Kim En Joong, who was selected through a competition organized by the town of Brioude. 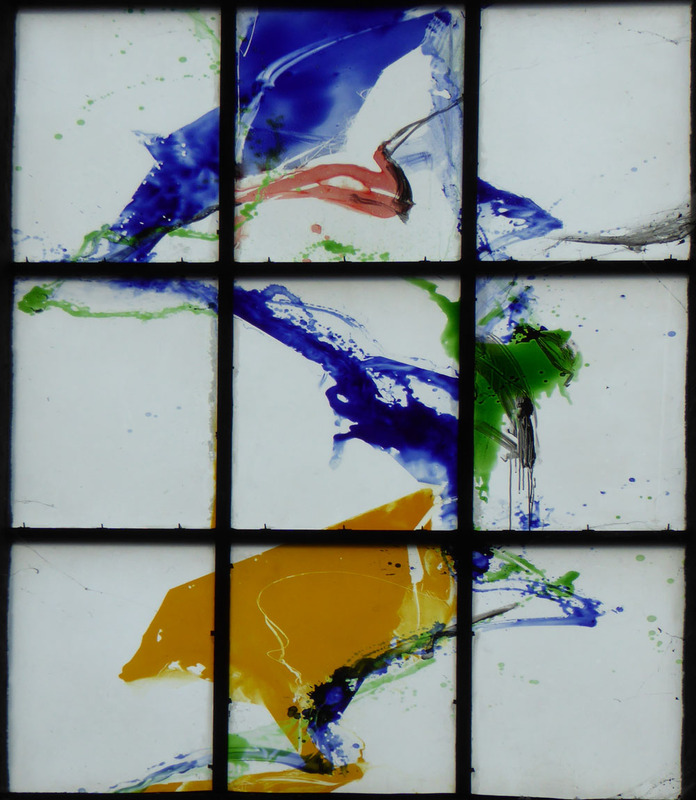 The church's old stained glass hadn't survived the 1789 French Revolution. 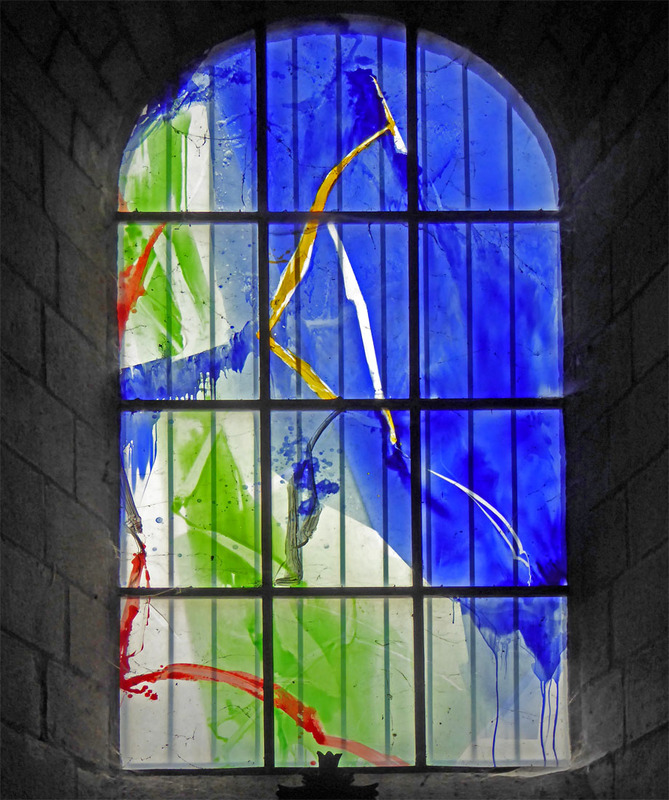 Different colors dominate in windows in different parts of the church, so that the light and colors inside the building change from one part of the day to to the next as the sun moves across the sky. I only photographed a very few of the windows, but there are 37 in all. 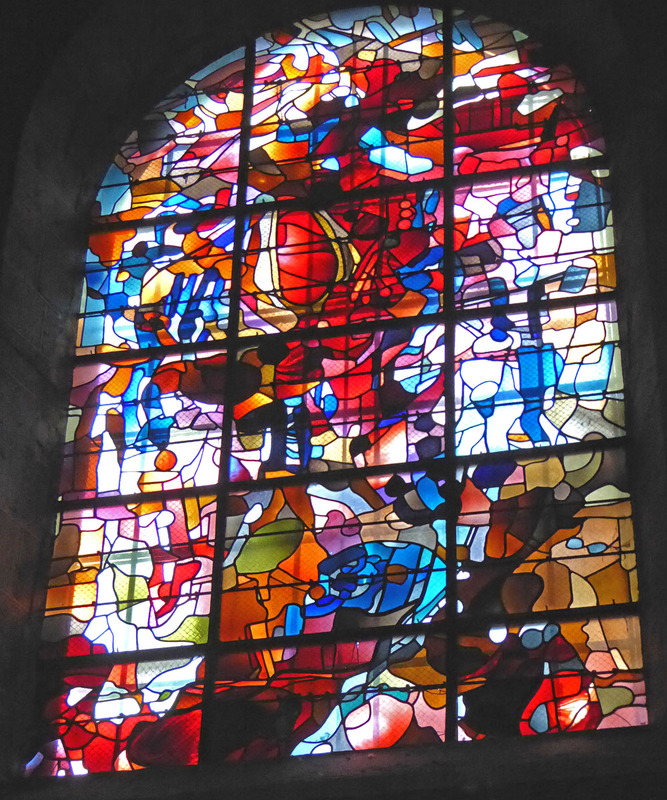 Kim En Joong has designed stained glass for churches in Tours, Angoulême, Brioude, and other towns and cities, including the Cathédrale Notre-Dame de Chartres. You can view dozens or even hundreds of Kim En Joong's creations here. 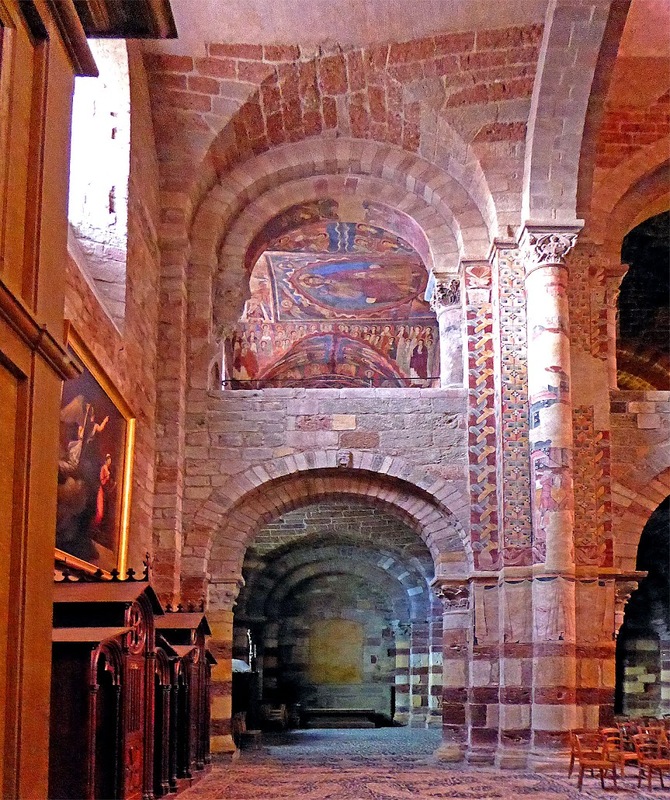 I regret that I didn't walk into the chapelle Saint-Michel inside the church in Brioude. You can see it in the photo below. I was too focused on seeing the church the way I had seen it pictured in the Michelin Guide, in a photo looking from the western end of the church toward the east and the altar. Oh well... The wall paintings in the chapel date back to the 12th century. Also, Walt and Tasha were outside the church waiting for me. The weather was cold and windy (though sunny). After my quick look around inside Saint-Julien, wanted to tell Walt he really should go in and look around for a few minutes too. He did, and I waited outside with the dog. I took advantage of the time to walk around the outside of the church, taking the photos I posted day before yesterday. 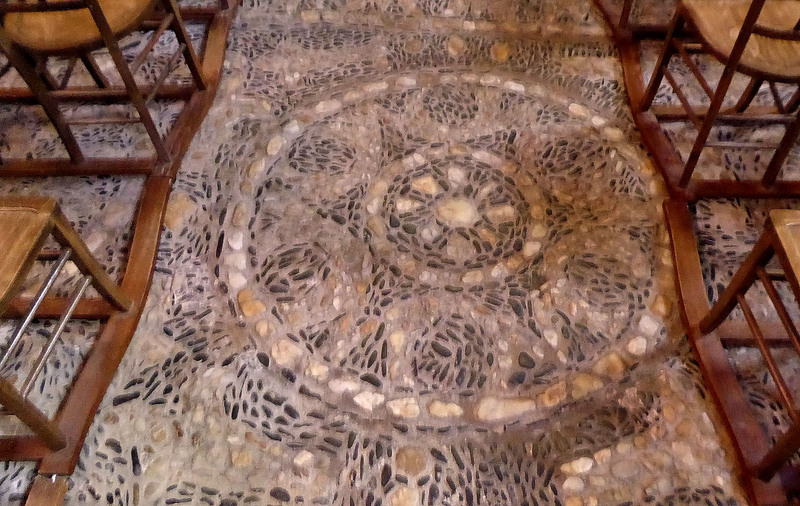 The pebble floors inside the Brioude church are remarkable. I read somewhere that they were first laid down in the 12th century and then either restored or extended throughout the church in the 16th. 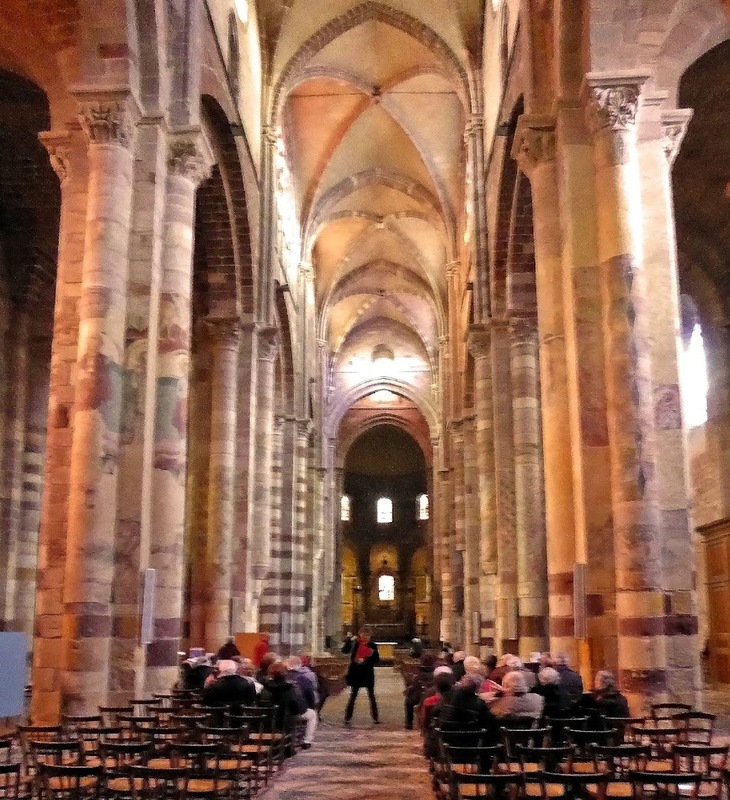 The towns of the Auvergne region are striking in part because of all the cobblestone streets everywhere, and here they even become the floor of a magnificent building. The town crowds right up to the church except around the eastern end (le chevet), making it hard to get photos of the exteriors. Here's one view from the nearby streets of Brioude It shows the church's "lantern tower" — a tall structure built over the junction of the four arms of a cruciform (cross-shaped) church, with openings through which light from outside can shine down to the building. Many lantern towers are octagonal, and that shape gives an extra dimension to the decorated interior of the dome. The lantern tower was the last part of the church to be built. I have a series of photos of interior and exterior details of the basilica that I want to post over the next few days. Maybe it's time for another slide show. We're having rainy, chilly weather now, April being cruel and all, so processing such photos to put them in a slide show will occupy my time. That's the official name of the church in Brioude that we stopped to see on a Saturday morning, last March 9. It was a perfect day and a perfect stop. The bonus was that Saturday is market day in the town, so there were a lot of people out shopping and a lot of market stalls. Even so, parking the car and walking around the town with the dog on a leash was easy. The Brioude market is where we bought some of the local cheeses I posted about a couple of days ago. 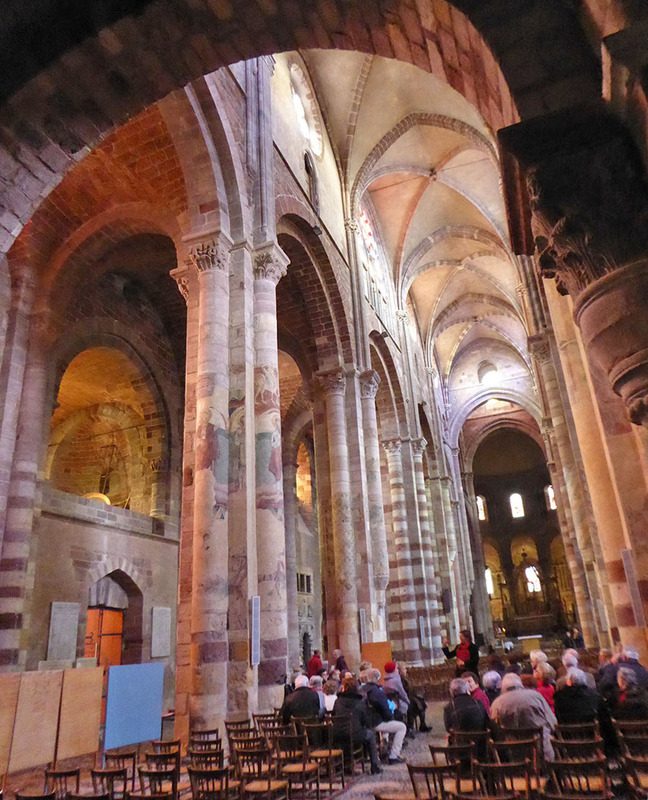 Anyway, I really wanted to go into the big church and see the interior, after seeing a photo of it in the Michelin Guide. Construction began in the 11th century on the site of earlier church buildings. 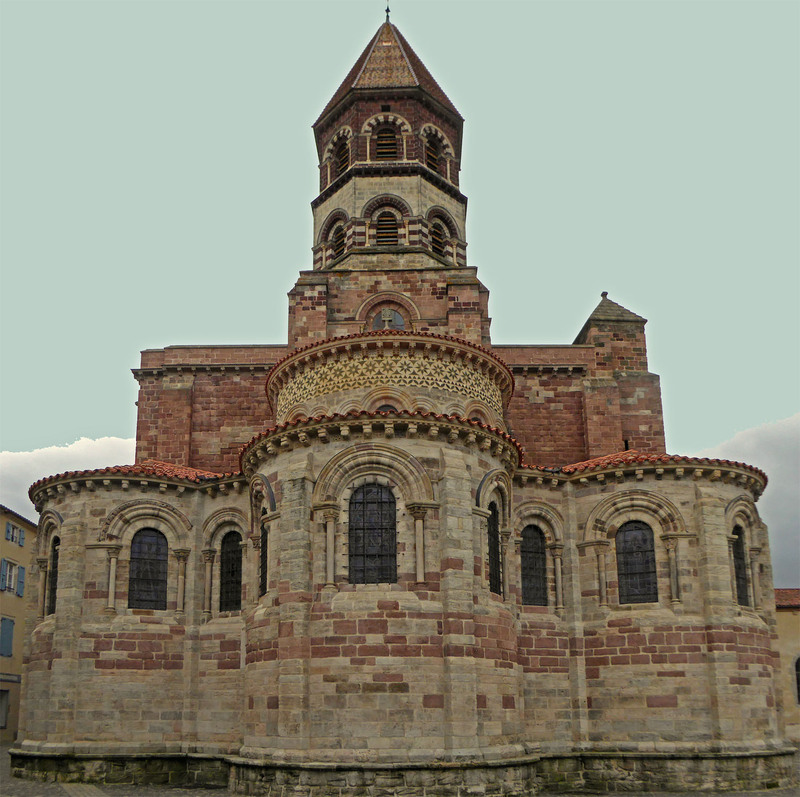 Saint Julien, a Roman soldier who had converted to Christianity and sought refuge in the Auvergne mountains, was martyred (decapitated) near Brioude in the year 304 A.D.
Three successive churches were built over the site of his tomb in Brioude, and pilgrims came from all over France for centuries. In the 6th century, Grégoire de Tours, historian and the bishop of Tours (near Saint-Aignan), wrote about saint Julien and Brioude. 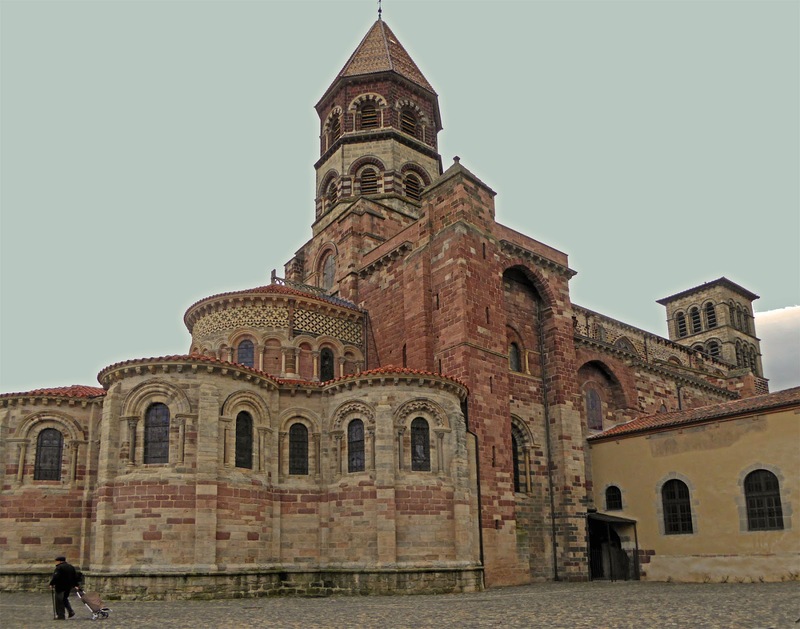 The church you see today in in the polychrome Auvergne style and was built largely over the years from 1060 into the early 1200s. On that Saturday morning a few weeks ago, I went into the church at the tail end of a big group on a guided tour, so I had to try to stay out of the way while still getting some photos. Here are three images that might give you a feel for the volume and height of the church. It's about 75 meters (250 feet) long and there are vaults as tall as 22 meters (nearly 75 feet). The town of Brioude (pop. 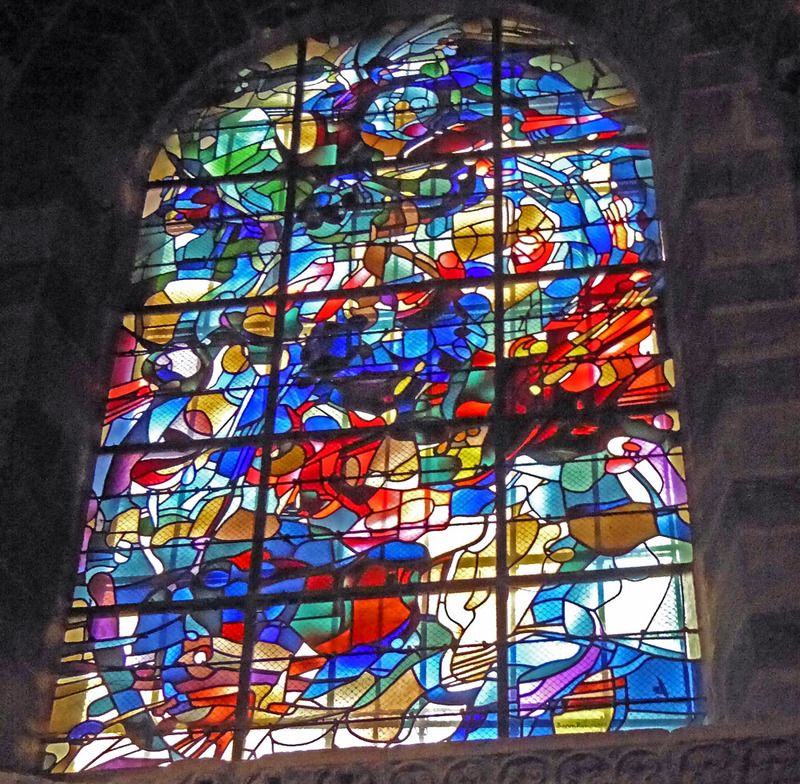 6,700) is on the main road that runs between Le Puy-en-Velay and Clermont-Ferrand. Each of these larger places is at least an hour by car from Brioude, which is a town that has a history going back to Roman times. I have to admit that I had never heard of it before our recent trip to the region. 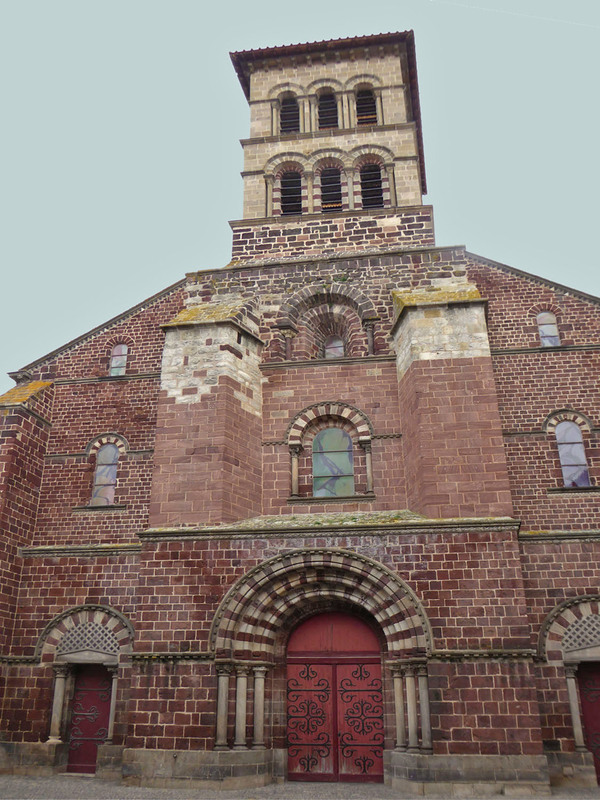 Brioude is famous for its church. It's the largest Romanesque church in all of the old Auvergne province. 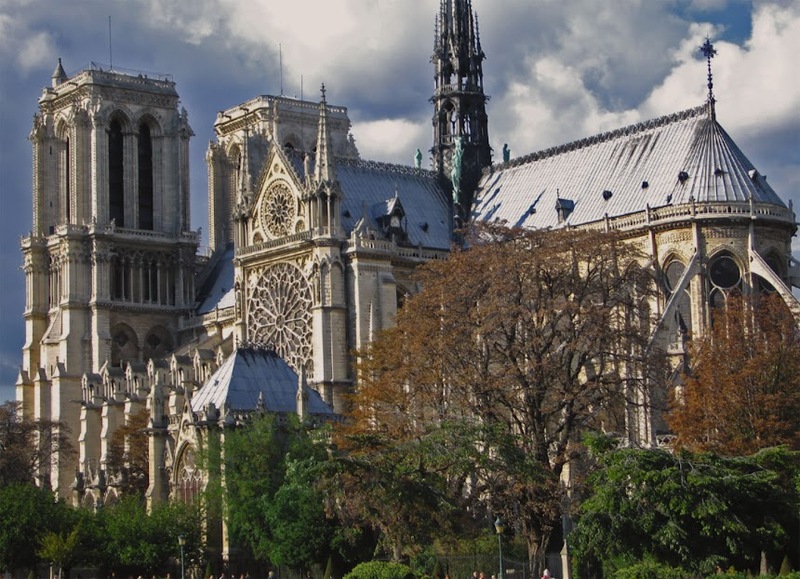 In 1957, it was elevated in status by Pope Pius XII and classified as a "minor basilica" — of which there are more than 150 in France — mostly because of its outstanding architecture. (The only four "major basilicas" are all in Rome.) I have to admit too that my first glimpse of the Brioude church didn't overly impress me. The west front looked very plain. Going inside and walking around the exterior of the building changed my mind. So we had decided not do the two- or three-hour drive round-trip from Le Puy to Brioude during the week. There were other places, including Clermont, Saint-Flour, and La Chaise-Dieu, that we didn't visit because the drive was too long either because of distance or because of the kinds of twisty mountain roads we'd have to drive on. Iffy weather was also a factor. 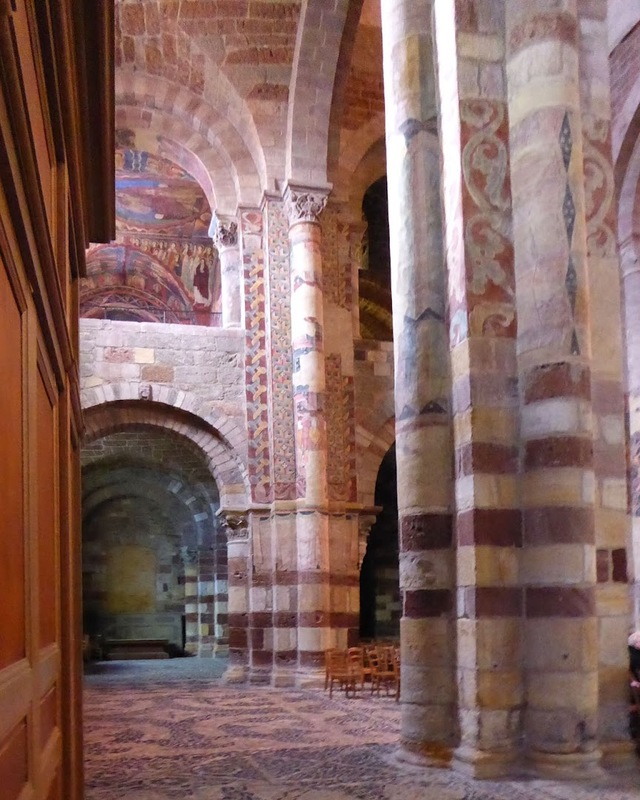 Still, in the Michelin Guide to the Auvergne, which I didn't really have time to study until we got to our gîte in Le Puy, there was a stunning photo of the interior of the church in Brioude. 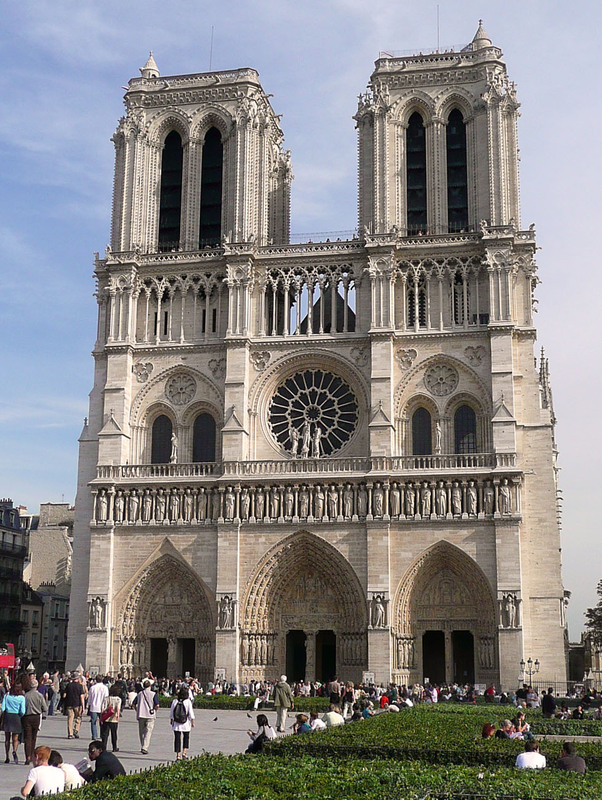 I wanted to see it, and we would be driving right past it on our way back to Saint-Aignan on a Saturday morning. I told Walt I wanted to stop and take a walk around the town, weather permitting. And I definitely wanted see the interior of the church. So we stopped and did all that before continuing the drive back toward home.